Time to decorate for Halloween and we can't think of a better way than decking out the obvious pet items around the house. 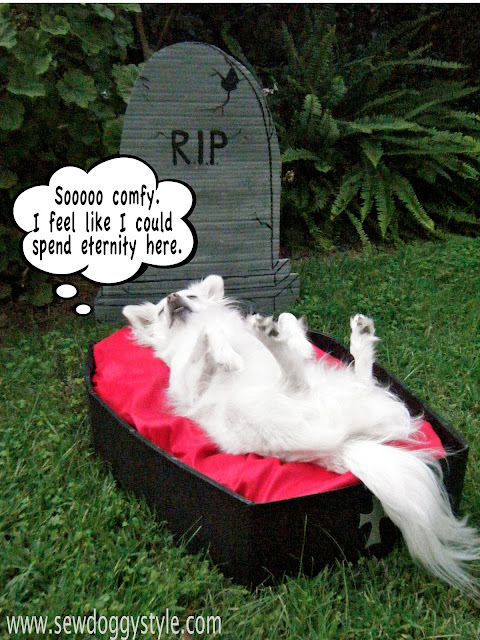 Besides, every pet needs a coffin...er, I mean, bed. We also used Mod Podge for the first time ever with great success, wouldn't you say? You'll notice in the next photos the cardboard is black. That's because I originally spray painted it black. The cardboard still looked so crappy. 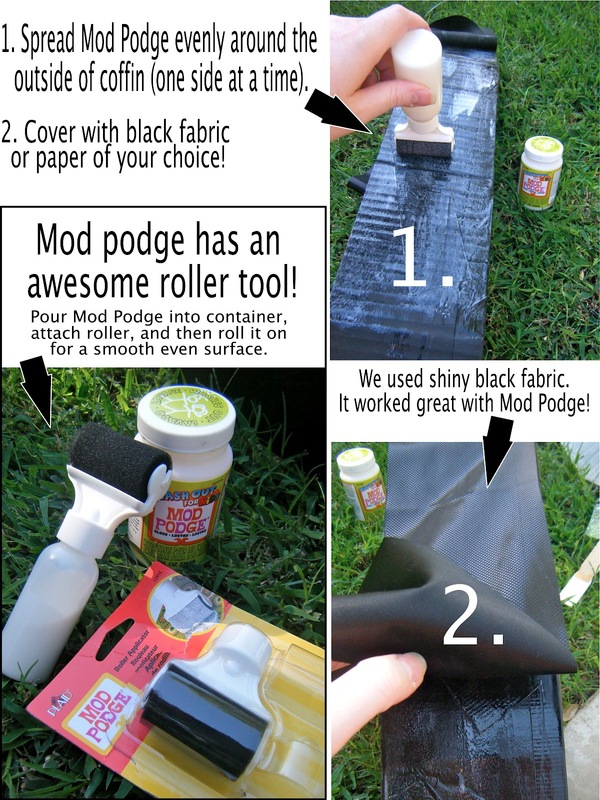 Mod Podge to the rescue!!! Mod Podge is a glue/finish/sealer all-in-one product that's pretty awesome. Sealing fabric or paper to the sides will help hide all the imperfections of the cardboard too. We used Mod Podge Wash Out for Kids (and for Mod Podge Virgins like myself?). There's a lot of cool varieties out there, including Mod Podge Sparkle and Mod Podge Dimensional that we will get our hands on later. 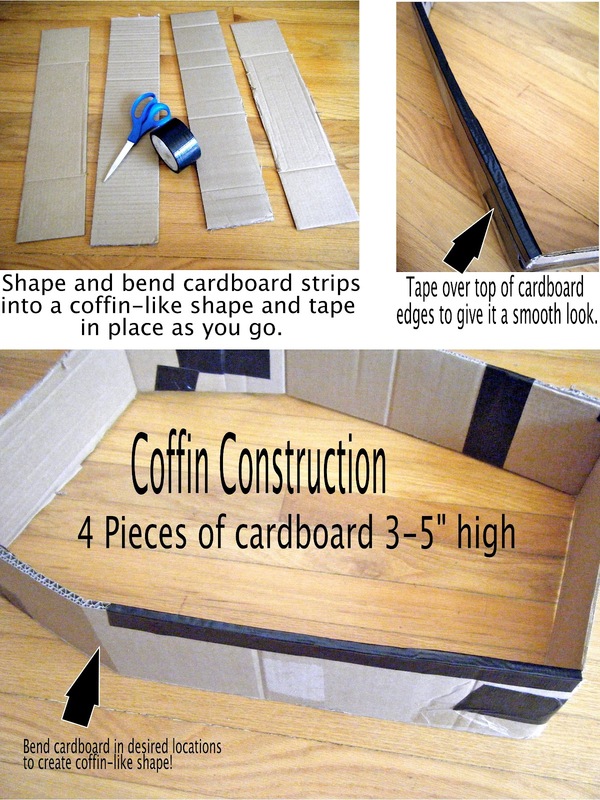 Here's where you can get extra creative and use Mod Podge to decorate/seal the outside of the coffin. There is no sewing involved in this bed. Just cover the pillow and tuck the sides of the red fabric in. Voila! As usual, Sebastian loves all of his projects made by his momma. He jumped right in and got cozy...a little too cozy. 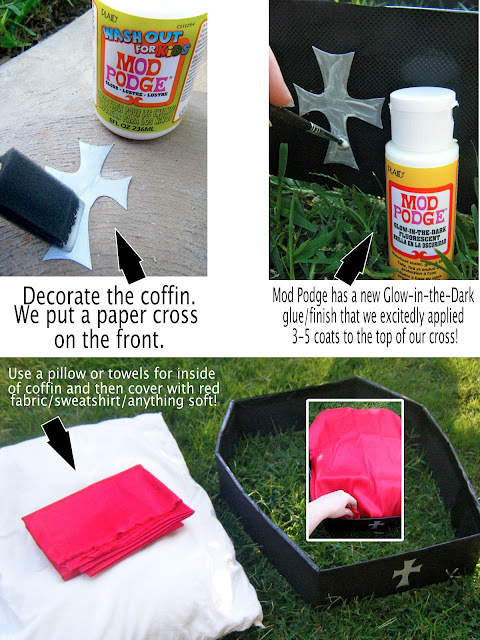 Check out more ways to use Mod Podge on their facebook page. Find our post disclosure here. Oh I love it! I'm going to have to try that. This just made me smile! What a ham Sebastian is! 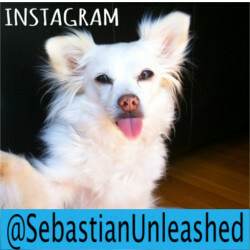 Sebastian! I nearly had a heart attack. Don't going dying on me please. I woof you! Leela. This is so fun. 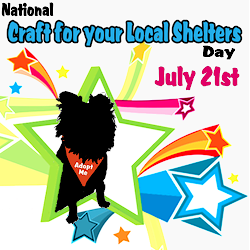 I hope you stop by Sew& Tell to share it! This is adorable!!! Love, love, love it! This is so great! And what a model you have... is Sebastian planning on waiting out on the front lawn to scare trick-or-treaters? While this idea is super cute and I would love to make it....my question has to do with the adorable puppy dog! What bread(s)??? We rescued a dog last year that looks very similar and I've been trying to figure out what breeds she is! Any ideas?? Yes, he is a Mini American Eskimo Mix! He's from the pound...looks a little Papillon'ish at times. 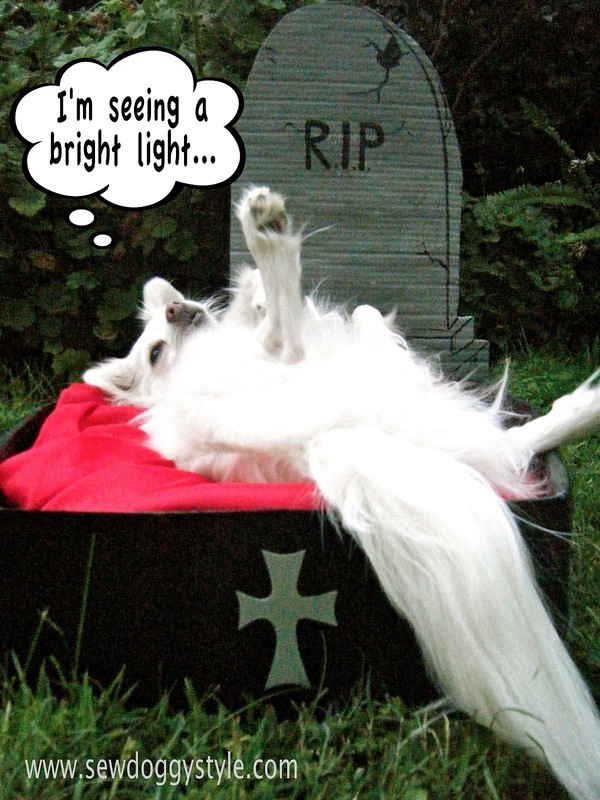 But definitely has Eskie in him. This is an awesome idea. I made the coffin doggy bed and my dog loves it! I would like to share a pic but I don't know how. This is really cute! I'm sure my daughter would love to have this for her dog. Anyway, great idea for Halloween party! Absolutely nice love it , you made the best thanks for sharing it I'm going to try this soon hope it's look nice like this ! 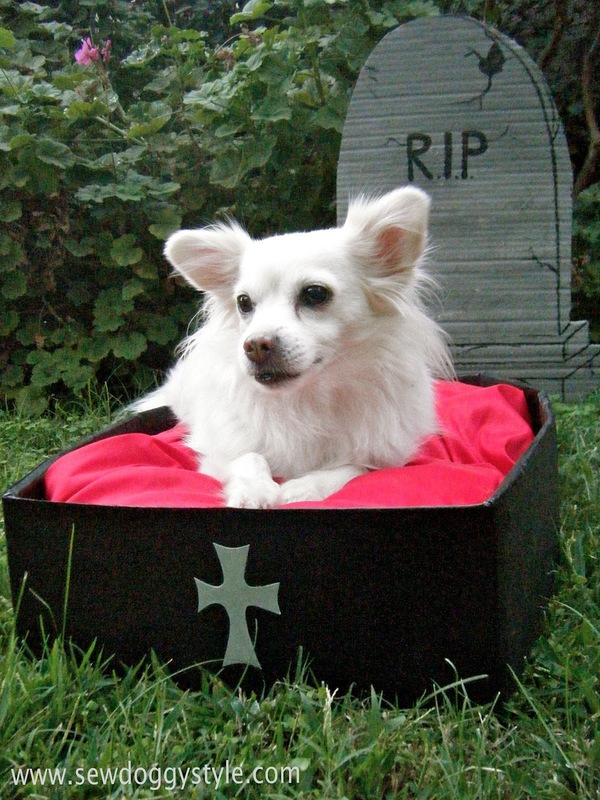 Best Pet Beds for your dogs.